The autumn colored trees hang over the quiet water of the Oxtongue River in Oxtongue River-Ragged Falls Provincial Park in Ontario, Canada, providing shade to the visitors who have been canoeing. People have paddled along the Oxtongue River in these rental canoes and stopped to rest on the banks where they can explore the wilderness and beauty surrounding Oxtongue River-Ragged Falls Provincial Park. 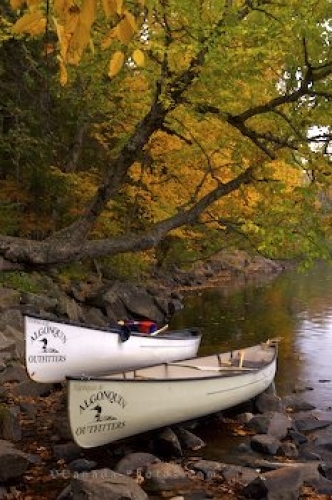 The Oxtongue River is gentle in places making the trip in these rental canoes very relaxing while other areas are extremely shallow and care must be taken in and around the rocks. Waterfalls and rapids are also found along the river making canoeing dangerous for beginners or people who are unaware of the path the river takes. Oxtongue River-Ragged Falls Provincial Park in Ontario, Canada is a fascinating place to explore especially during the Autumn when the wilderness comes alive in brilliant colors. Picture of rental canoes in Oxtongue River Ragged Falls Provincial Park, Ontario.